Ahoy there! Welcome to Treasure Island Adventure Park, Eastbourne. A pirate themed adventure park with a unique mix of indoor & outdoor attractions, to ensure a great day out - whatever the weather! 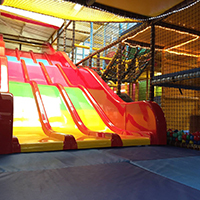 An indoor soft play area on 2 levels with other fun activities also has a separate area for tiny tots. There is a comfortable seated area for adults with refreshments & snacks available from our Hungry Pirate's Cafe. Climb aboard Long John Silver's shipwreck with slides, bridges, netted walkways and zip slide. 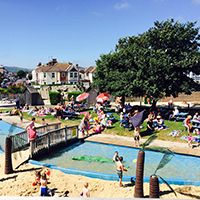 Enjoy the spacious parkland or splash in the paddling lagoon & look for treasure in the sandy beach. Our pirate themed 18-hole miniature golf course. 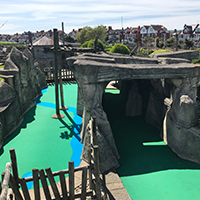 Putt over & under bridges, through caves with extraordinary themed landscaping and enchanting Pirate lore. Open everyday 9:30am-6:00pm. Relax & enjoy a hot drink and a bite to eat at the Hungry Pirate's Cafe while the kids play! 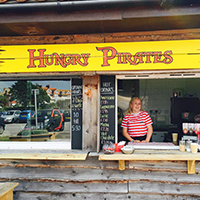 Or pop by the Hungry Pirate's Hatch, located on the side of Treasure Island for takeaway food & drinks! Open everyday 10am-5:30pm.